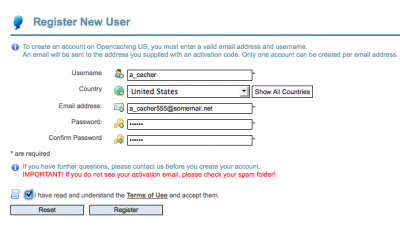 Step 1: Register for a free OpenCaching North America account. Visit OC NA registration form (here). Select the country you are in. In the future this information will be used to automatically translate the site text for you. Enter your email address (an account activation email will be sent to this address when you complete the registration form). Enter a password in the password field. Enter it again in the confirm password field. Passwords must be between 3 and 30 characters long. Step 2: Select geocaches to hunt. Click Seek A Geocache on the sidebar at OC NA. Select the cache parameters for your search. For most user's, the default should be ok.
Scroll down to the search method you wish to use and choose whether to show the results on a map. by Zipcode: Select a search radius around the zipcode entered. by State: List all of the caches in the selected state that match the search parameters. by Distance: Select a search radius around the coordinates entered. by Geocache Name: Find a cache by it's name. by Text: Find a cache with the specified text in the name, description, logs, and/or pictures. 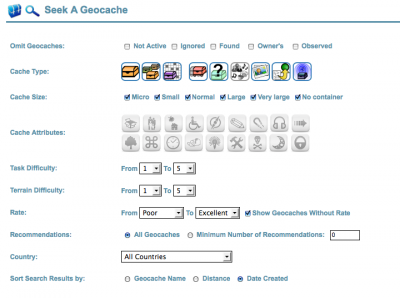 by Geocache Owner: Find caches hidden by a specific OC.US member. for Logs: Find logs written by a specific OC NA member. Click the Search for the chosen method to get your results. Let someone know where you are going (and take a friend). Head out for some fun! Step 4: Find the cache and sign the logbook. Try to focus on the environment and not your GPS. Look for something that seems out of place or unnatural. If you're still having trouble, decrypt the hint. Step 5: Go online and share your experiences at OC NA. Visit the online page for the cache you found. Click the New Log Entry tab at the top of the page. Select the type of log. Change the date and time of your entry if you wish. Rate the cache. Find out more about cache rating. Share your experiences in the Comments section. Any question, no matter how simple or strange, is OK to ask. Find a friend to go geocaching with you! Always take a pen or pencil with you. If you want to trade trinkets, take some with you. The accepted rule is if you take something, you must leave something. Mark your vehicle as a waypoint so you can easily get back to it! Leave the geocache just as you found it. Make sure the public (aka muggles) doesn't see you retrieve or hide the cache. Be safe... watch for critters, snakes, bugs, sharp objects, dangerous areas, etc. Be sure to carry extra batteries, water to drink, etc. 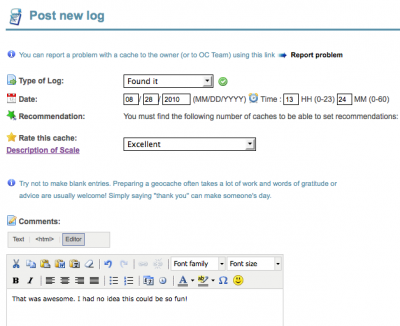 Be sure to check out the Opencaching North America forums. This page was last modified on 16 July 2013, at 15:37.